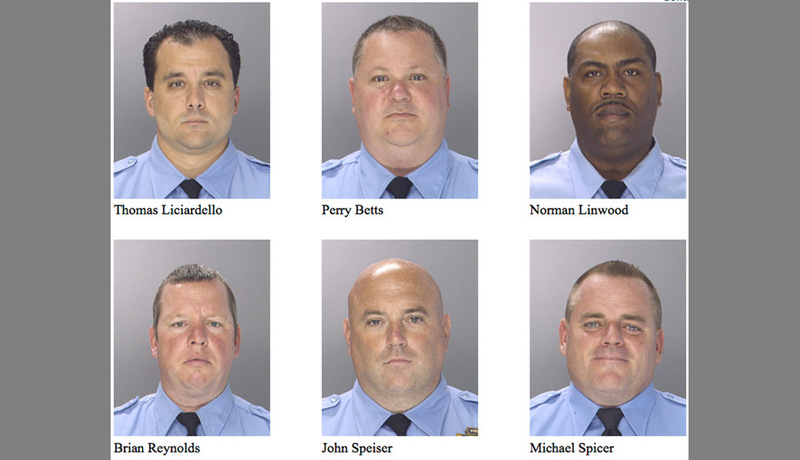 From February 2006 to December 2012, six members of the Philadelphia Police Department’s Narcotics Field Unit (NFU) engaged in an alleged crime spree that included kidnapping, extortion, records falsification, drug dealing, and firearm-related charges, said Assistant US Attorney Zane David Memenger at a morning press conference. 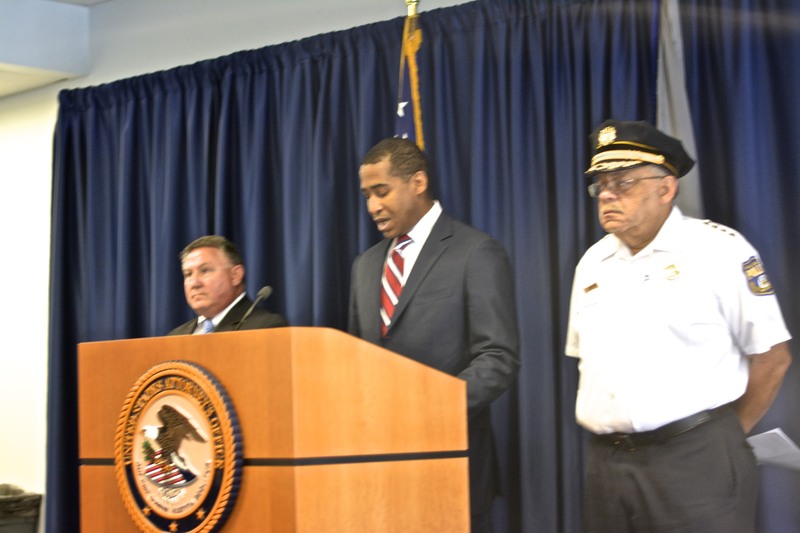 With Philadelphia Police Commissioner Charles Ramsey and FBI Special Agent Edward Hanko flanking him, he announced 26 charges have been brought against the six officers, who were arrested in a pre-dawn sweep today. Thomas Liciardello, Brian Reynolds, Michael Spicer, Perry Betts, Linwood Norman, and John Speiser were transferred out of the NFU in 2012 by Commissioner Ramsey, after it was announced that a federal investigation had started, and remained on police payroll until their arrest this morning. Shortly after the FBI announced its investigation in 2012, the Philadelphia District Attorney’s office declared that the officers could no longer testify in drug cases because of serious credibility issues stemming from the alleged criminal conduct. The DA’s move prompted the expunging of hundreds of cases. Over $770,000 in settlement money has been awarded to victims who claimed the officers provided false testimony and framed them for crimes they did not commit. Several dozen more lawsuits await resolution. Union contract rules, ardently defended by McNesby, have been criticized because they prohibit the rotation of officers out of units like NFU and into other areas of the department. Critics contend this engenders the type of corruption and abuse federal authorities charged in shocking detail this morning. Commissioner Ramsey referenced these rules a number of times during the press conference. The officers are now suspended with intent to dismiss, Ramsey announced. The six NFU officers face 26 counts including RICO conspiracy, kidnapping, robbery, and extortion. Prosecutors presented details about the allegations, which include stealing $80,000 from the home of a suspected drug dealer; breaking into a residence and threatening to shoot the occupant; stealing $13,000 from a family safe belonging to the parents of a suspected drug dealer; interrogating a suspect while dangling him over an apartment balcony; brutalizing other victims by kicking and punching them in the mouth; and hitting another victim in the back of the head with a steel bar. This is one of the worst cases of police corruption I have ever seen. “The crimes here are indefensible. That many of the victims were drug dealers, not Boy Scouts, is irrelevant. Police officers are sworn to uphold the law – and to do it ‘by the book.’ This corrupt group chose to make their own rules. Now they will have to answer for it,” FBI Special Agent-in-Charge Edward Hanko, who led the two year investigation, stated at the press conference. Later in the afternoon, the officers were arraigned by federal Magistrate Marilyn Heffley. Some members of the officers’ families openly cried as the six men were denied bail. The men, some with stunned expressions, were then led away in handcuffs. All but one of the officers, John Speiser, face maximum statutory terms of life in prison (seven years minimum); Speiser, who was charged with only two crimes, RICO conspiracy and records falsification, may face up to 40 years in prison. Their detention hearing is set for Monday morning; The Declaration plans to cover these proceedings.